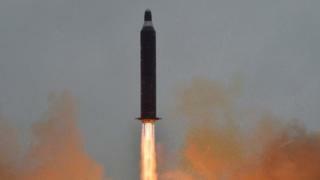 North Korea has conducted another missile test, South Korea’s military has said. The White House said the medium-range missile had a shorter range than those used in North Korea’s last three tests. It comes a week after North Korea tested what it said was a new type of rocket capable of carrying a large nuclear warhead. Last Monday, the UN Security Council again demanded that Pyongyang conduct no further such tests. It stressed the importance of North Korea “immediately showing sincere commitment to denuclearization through concrete action”. The latest missile flew about 500km (310 miles) towards the Sea of Japan, South Korea’s Joint Chiefs of Staff said. Last week’s missile travelled about 700km. Japanese news agencies said the missile probably fell into the sea outside Japanese waters. Japan’s Chief Cabinet Secretary Yoshihide Suga told a press conference a protest had been lodged with North Korea. South Korea said the latest test was conducted in Pukchang, in the west of the country. A missile exploded soon after take-off from Pukchang last month. Earlier on Sunday, the North’s state-run media had said it would continue to launch more “weapons capable of striking” the US. In early May, the US said a missile defence system it had installed in South Korea was now operational. The Thaad system can intercept North Korean missiles, although full operational capability is still some months away. North Korea and its ally China have condemned the installation of the system. However, there is no sign that Thaad was used against the missile tested on Sunday. Newly-installed South Korean President Moon Jae-in, who is seeking deeper engagement with the North, has convened an urgent meeting of his national security council in response. This would be the 10th detected missile launch by North Korea this year: outside experts agree that it’s making progress in its stated aim of having the ability to strike the mainland US with nuclear weapons. Though it’s not there yet, the latest tests have been of missiles capable of reaching American bases in the Western Pacific, albeit with some failures. There is intense pressure on Kim Jong-un from the US, which is seeking the help of China. Repeated and more frequent testing of missiles, despite prohibition by the United Nations, indicates the North Korean leader feels able to defy that pressure.